Eugene is home to friendly, outgoing people; an environment with something for everyone – from the rugged outdoors to quiet gardens to bustling city streets; and residents that appreciate healthy lifestyles, cultural diversity and the arts. First-rate services, excellent educational opportunities, top-notch health care and four fabulous seasons offering a year-round symphony for your senses. There’s no better place to live, work, or visit! Eugene was platted and recorded in 1852, and incorporated in 1862. Two years later, the community adopted a charter and took the first name of its founder, Eugene Skinner. 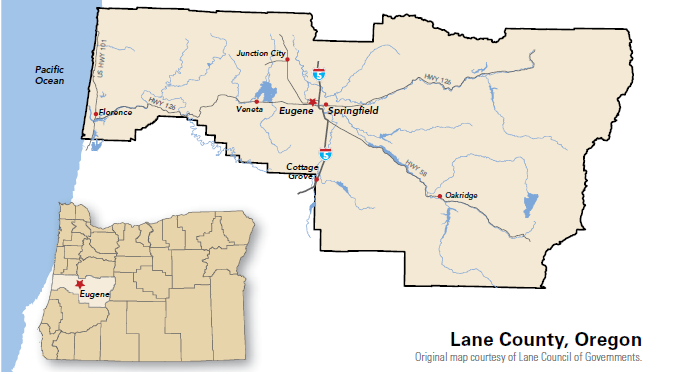 Eugene is in the southern Willamette Valley of western Oregon, 60 miles east of the Pacific Ocean and about the same distance west of the Cascade Mountains. With its strategic location, the Eugene-Springfield area offers an abundance of things to do places to go and sights to see, and you don’t have to go very far. In the mood for exercise? Try a quick jog around our many neighborhood parks, or for a full run on a professional-quality trail. For shopping, browse among one-of-a-kind mini-boutiques at our legendary Saturday Market ; every Saturday from April through December. Poke your head into a downtown shop or visit Oakway Center, Valley River Center, 5th Street Market and The Shoppes at Gateway. Activities abound for the kids as well. Check out the WAVE swimming and-wading pool, romp in the grass on the banks of the river, or steer that skateboard to one of our fine, specially built skateboard facilities. Cultural pursuits take center stage in our area. Take in a live performance at a local community theater, or catch a visit from one of the international stars whose talents are showcased at the internationally acclaimed Hult Center for the Performing Arts. Step into one of the many galleries displaying the works of local, regional and international artists. Or visit the vibrant Jordan Schnitzer Museum of Art at the University of Oregon. Then tune into the fine musicians at a variety of clubs, pubs and restaurants in the Eugene-Springfield area. And that’s just around town. By contacting emilyr@eugenechamber.com you can request a relocation packet, pocket guide, or additional information to be mailed.